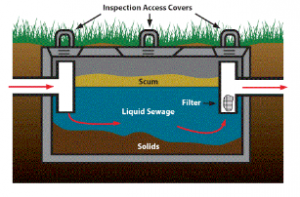 Who is Responsible for a Septic System? If your home is not connected to the public sewer system, all the wastewater your home generates is treated by an “individual waste water treatment system”, commonly known as a septic system. Every time that someone in your home uses water, wastewater is generated, this water goes down the drain and is treated in your own garden, on your own property! Just think, every time anyone washes their hands, washes the dishes, runs the washing machine, takes a shower, or flushes a toilet, all that wastewater needs to be cleaned and returned to the environment. As a homeowner, you are responsible for maintaining your septic system, so it’s good to know a little about your system and how it works. Most states provide “Septic Safe guidelines” for property owners except Queensland. We have written these FAQ’s on how a septic system works, why and how you should maintain your septic tank safely for you and your family. Please ring us if you have any other questions. A septic system is a highly efficient, self-contained, underground wastewater treatment system. A healthy septic system is a living ecosystem where bacteria do the work of digesting waste. Fats and solids are retained in the tank. Liquid effluent flows into the trench and is further treated by the soil. The right bugs (bacteria) thrive in the right proportions to digest waste and treat the water (effluent). A layer of fats (called scum), light solids float to the surface which prevents odours escaping. A clear layer (called effluent or liquid sewage), this is where bacteria breaks down the solids. This effluent flows out through an outlet pipe to the trenches. In some systems this effluent is stored in a holding tank. A layer of solids (called sludge), which sinks to the bottom. In most septic systems, the effluent is discharged from the septic tank directly into soil by pipes and trenches (an absorption field). At this stage, the effluent still contains large amounts of dissolved pollutants (salts and nutrients eg. compounds of nitrogen and phosphorus). It also contains disease causing pathogens (eg. viruses, bacteria and worms). In the absorption field, natural soil processes kill off more pathogens and break down some of the nutrients that cause pollution. This is a slow process, and soil bacteria need oxygen to work. It is important not to overwhelm the soil with too much effluent. In time, the effluent evaporates and is taken up by nearby plants or grass into the groundwater zone. Usually when a septic system fails, the trench is not functioning properly. When a septic tank overflows, the effluent can pass to the trench, blocking up the pipes. This causes sinks and toilets to back up in the house. Other signs include: slow draining toilets and drains, an odour of sewage and a wet area on or near the trench. Maintenance, maintenance, maintenance! If your system has been properly designed, sited, and installed, the rest is up to you. Inspect your system annually and pump as needed, usually every 3-5 years, depending on how many people are living in the house, avoid excess water use, and watch what you put down the drain and flush down the toilet. Can my septic system contaminate the ground water around my home? YES, particularly if the effluent is not adequately treated, as in a failing system. Untreated effluent can pose significant human health risks and can cause many human diseases. Once this untreated effluent enters the groundwater it is highly likely to be contaminated. Also, if this sewage reaches nearby streams or rivers, shellfish beds and recreational swimming areas may also be jeopardised. Yes, many materials that are poured down the drain do not decompose and remain in the tank. Don’t use disinfectants and bleaches, only use things that are safe for septic systems. And don’t pour grease, fats and oils down the drain. Flush only human waste and toilet paper down the toilet—avoid flushing dental floss, cat litter (including “flushable” varieties), hair, cigarette butts, cotton swabs, feminine hygiene products, condoms, paper towels, diapers, and disposable wipes (including “safe for septics”, they are not! ), birds, gold fish and animals (including the neighbour’s cat). These items could cause a blockage in your septic system components and cause a major failure! No. Adding a stimulator or an enhancer to a septic tank to help it function or “to restore bacterial balance” is not necessary. The naturally occurring bacteria needed for the septic system to work are already present in human poo. I’ve been in my house for 10 years and never pumped my septic tank. Why should I be concerned? YES! Over time sludge and scum build up in the septic tank and unless it is removed it will flow into the trenches, blocking the pipes. Once a trench is blocked, it must be replaced by a plumber, which is an expensive repair, costing anywhere from $3,000 to $10,000 or more. You may have a plumbing backup in your home. I am getting bad odours in the house or outside the house. Why? If the odour is inside the house, it’s more likely your pan connector rubber seal is broken letting the smell come back from the septic tank into the house. This seal needs to be replaced by a plumber or a handy man. If the odour is outside the house, it could either be from your vent pipe, crack or bad seal on your septic tank OR your tank needs pumping-out. If it is the vent pipe, you tend to get more odours from it in the winter months, if your tank does not need pumping extending the vent pipe will eliminate this problem. Toilet is backing up to the house, help! What can I do? You may need your septic pumped out, but if it is not due for a pump-out and your toilet is blocked, ring us and we can give you some advice on how to unblock it yourself before calling a plumber. How often should I have the tank pumped? How often you need to pump depends on the size of the tank and the number of people in the household. A septic tank should be pumped out every 3 to 5 years. Some alternative systems that are more complex may need pumping more frequently. If you are unsure if your tank needs pumping, have it inspected and get a recommendation for how many years you can go between pumping. Write this schedule down on a maintenance chart or where you keep your maintenance records and stick to it! How much will it cost to have it pumped? Pumping can cost between $330 upward depending on the size of the tank. We dispose the waste at the appropriate council sewerage plants and we are charged by the litre for this disposal. Councils increase their fees automatically every year and sadly we are left no choice but to increase our fees on to our customers every year. By pumping your tank regularly, you can avoid costly plumbing bills of $3,000.00 to $10,000.00 or more when trenches need to be replaced. The cost and effort to get your tank pumped every 3 to 5 years is minimal compared to being connected to the main sewerage system. the Bundaberg Regional Council $705 per year for sewerage in their rates! Queensland is the only state that doesn’t not provide septic tank guidelines to rate payers, we hope you find this information helpful.